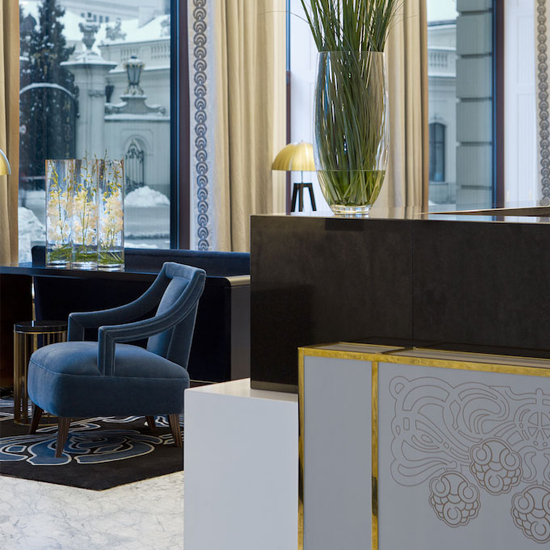 Comissioned by the renowned Anita Rosato Interior Design, London to create a unique engraved leather panel for the reception desk for Warsaw’s legendary Bristol Hotel. 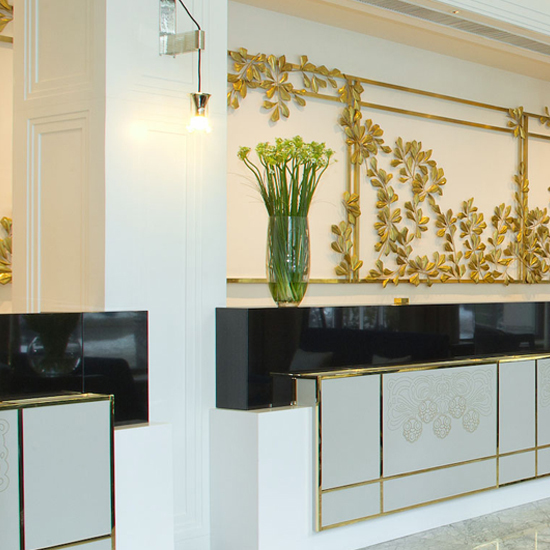 Taking the iconic motif, which is a critical brand element of the hotel’s formidable heritage, Genevieve developed a delicate floral pattern. This was engraved into sumptious cream saddle leather and hand gilded, using 23 carat gold leaf. The finished piece is a fitting gesture of privileged luxury in a new episode of the continuing tale of one of the Worlds truly grand hotels. Morey Smith define contemporary commercial interior design. Aldwych House is an iconic building in the centre of London. 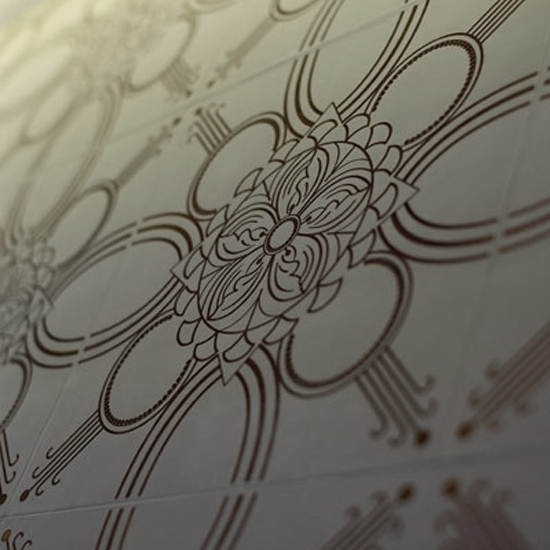 Morey Smith commissioned Genevieve to design a bespoke leather tile for extensive use within the main reception area. 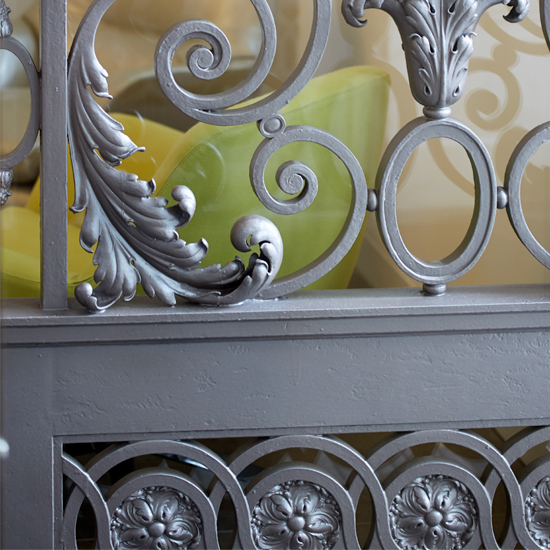 Taking reference from the original, ornate wrought ironwork architectural detail of the building. The client brief requested using elements of an existing design of Genevieve’s called Starflower. The Deco, curvilinear form of Starflower is cleverly spliced with the complex form of the wrought iron. The result is a beautiful, intriguing piece of art which manages, simultaneously, to be historically informed yet entirely contemporary. 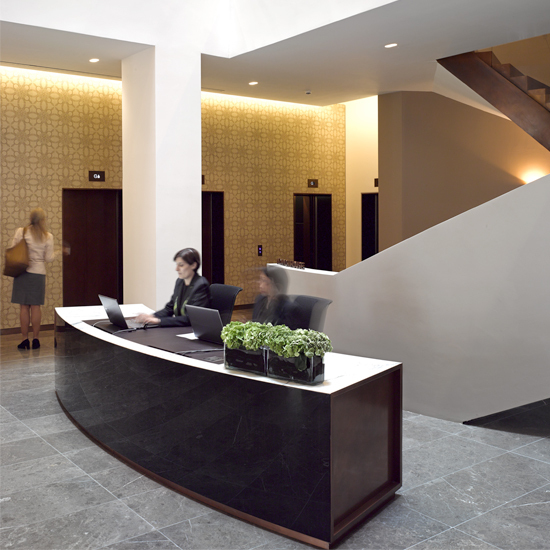 Engraved into rich leather tiles which are used to clad the lift lobby and main reception area. 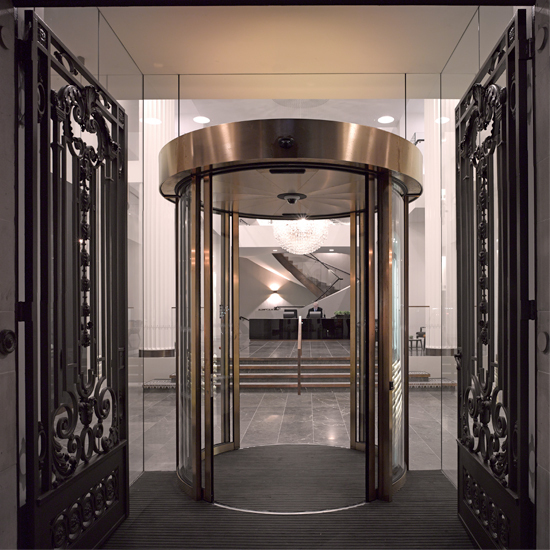 Additionally, the design was etched into glass paneling throughout the building. A discrete layer of character applied to a piece of London architectural heritage. Formula 1 and Silverstone directly commissioned Genevieve to design a series of panels at Silverstone to mark their F1 season. The brief was to reference the rich leatherworking heritage of Northamptonshire. World famous, high quality shoe companies, including Church’s, Trickers and Cheaney all originate from the county. The brief also requested that the design demonstrates the excitement of speed and motion central to the appeal and purpose of Silverstone and Formula 1. 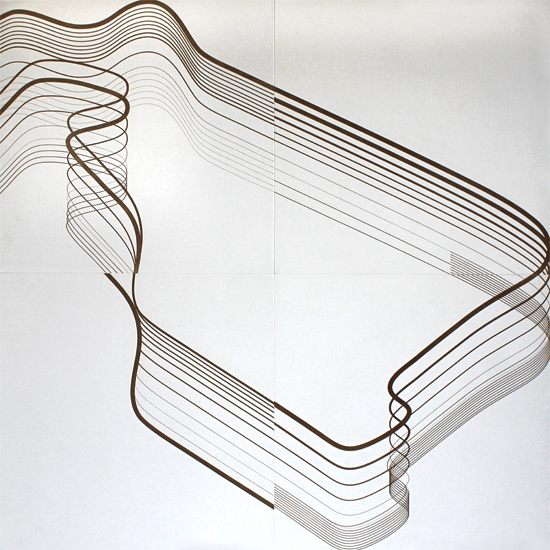 Genevieve took the iconic shape of the Silverstone track as a graphic element. 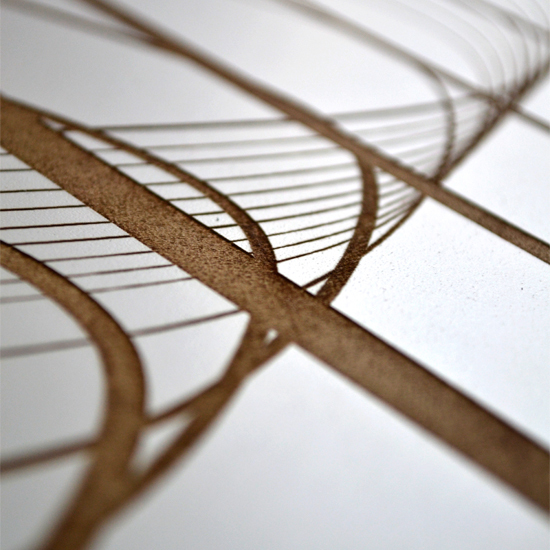 Repeated and offset overlays created an energetic yet elegant form. This was then deeply engraved into a beautiful, pristine white saddle leather. Erudite decorative art carrying a subtle significance.